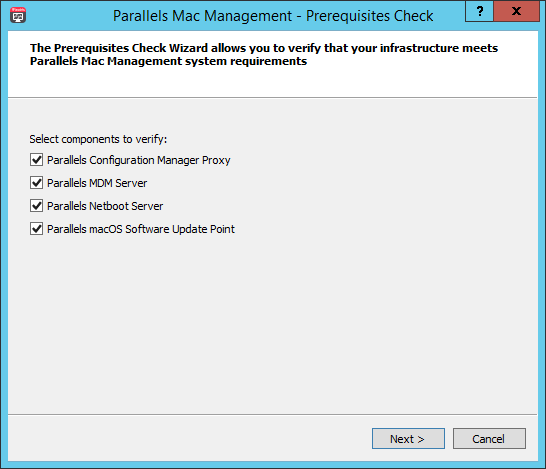 Parallels Mac Management Prerequisites Checker is a standalone utility (a Windows application) that allows you to verify that your infrastructure meets the Parallels Mac Management system requirements. Run the utility before you install Parallels Mac Management to identify and correct possible issues or problems. The PMM-Prerequisites-Checker.exe file is a self-extracting archive. When you double-click it, it will unzip into a temporary folder and the application will run automatically. Note: If you are using Avast antivirus, it may display a warning when you run this signed self-extracting archive. Simply choose to ignore the warning and run the file. Once you select the desired component(s), click Next. The subsequent wizard pages will ask you (in some cases) to specify addition settings and will check your system for each Parallels Mac Management component that you selected. The following describes each possible wizard page (you may see all or some of them depending on the components that you select). 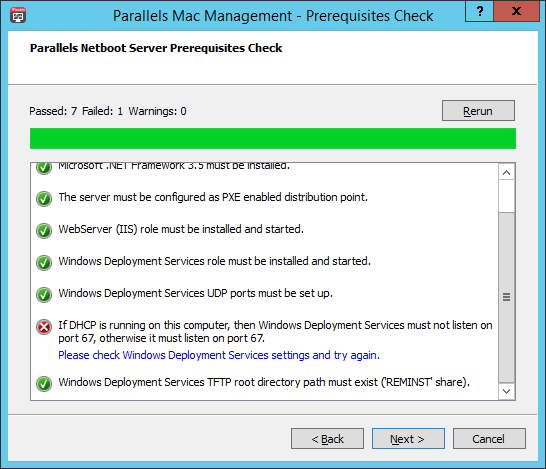 This page allows you to check if the requirements for installing and running Parallels Configuration Manager Proxy are met. First, specify the SMS Provider location (local or remote server) and a user account under which you intend the Configuration Manager Proxy service to run. The account must have read/write access to the SMS Provider. When you click Next on this page, it will check if the requirements are met and will display the results as a list where the green checkmark in front of the requirement description indicates that it’s OK and a red one indicates otherwise. If one or more of the requirements are not met, you will need to resolve it before you can install and use Parallels Mac Management. Wizard pages that check other components (described below) work in a similar manner. 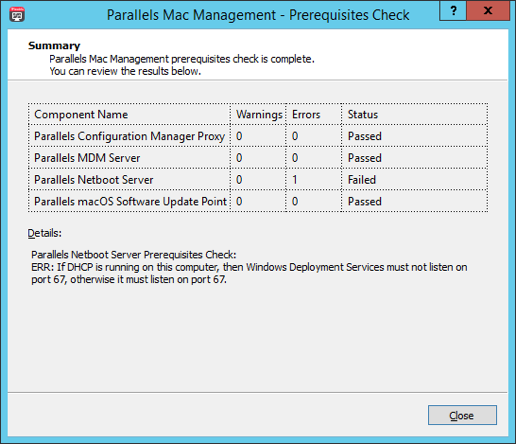 This page checks if the requirements for running the Parallels MDM Server are met. You don’t need to specify any addition settings here. MDM server certificate, because it requires the purchase. APNs certificate, because it requires CSR roundup with Parallels server. This page checks the Parallels NetBoot Server requirements. As with other components, the results are displayed as a list of the requirements with green or red markings indicating success or failure. On this page, you need to specify the account name and a password that you intend to use for running the Parallels macOS Software Update Point service. The account must have administrative rights on the local server and must be a member of the WSUS Administrators group. The last page of the wizard displays the summary, including the list of components that were checked and the results. If a component was not included in the examination, the Status column will indicate that it was skipped.